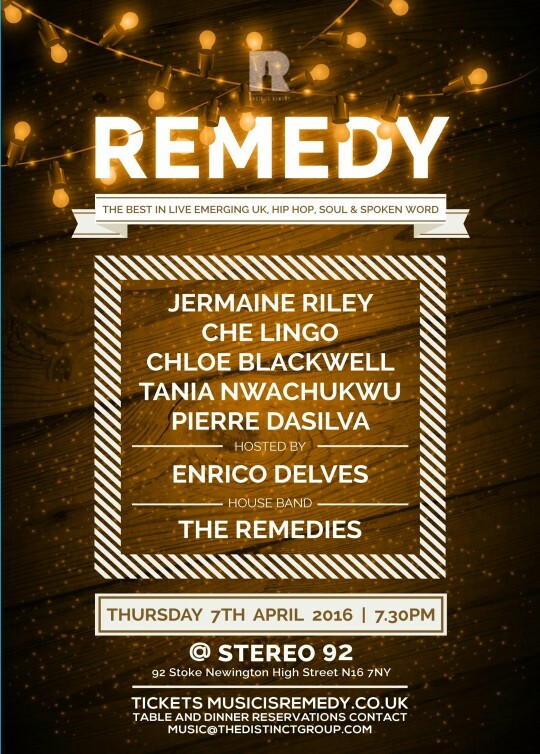 Its been a long time coming but the original Remedy night that started it all is returning on Thursday April 7th 2016. This year marks the 10th anniversary of the first Remedy night @ The Oh Bar in Camden. We spent 2 and a half years making some incredible memories and delivering some special moments. As we begin to mark 10 years of Remedy we will be launching a new Remedy night to take back that famous first Thursday of the month slot that saw us build our brand and create some amazing nights. In our new home Stereo 92 you’ll be able to hear some of the best emerging talent in the country in a warm intimate setting like you have never heard them on the circuit before. Strictly UK and as always the best in Hip Hop, Soul and Spoken Word. Plus enjoy some amazing food before and during the show! To relaunch we have a jam packed line up of insane quality including Jermaine Riley, Che Lingo, Chloe Blackwell, Tania Nwachukwu and Pierre Da Silva. Its all live and hosted by myself Ash Remedy and the incredible talent that is Enrico Delves. Not forgetting the house band The mighty Remedies will be on stage too!